5 Seats Left! Register your team today! RCRA Refresher Training is Annually Required! ERG is now in open-enrollment for an all-inclusive training course. This mandatory course will provide our clients with affordable training that (1) meets/exceeds regulatory requirements, (2) focuses specifically on issues of interest in industrial operations, and (3) provides an enjoyable, informative experience. Our trainers are experts in their fields; have extensive experience working with industrial companies, and work hard to make their courses interesting. We are offering the following class that is required of virtually all hazardous waste generators and many other companies as well. 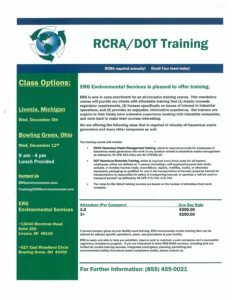 RCRA Hazardous Waste Management Training, which is required annually for employees of hazardous waste generators who work in any position related to hazardous waste management as defined by 40 CFR 262.34(a) and 40 CFR265.16. DOT Hazardous Materials Training, which is required every three years for all hazmat employees, which are defined as “a person (including a self-employed person) who loads, unloads, or handles hazmat; tests, reconditions, repairs, modifies, marks, or otherwise represents packaging as qualified for use in the transportation of hazmat; prepares hazmat for transportation; is responsible for safety of transporting hazmat; or operates a vehicle used to transport hazmat” as defined by 49 CFR 172.700- 172.704. The rates for the listed training courses are based on the number of attendees from each company. If several people/group at your facility need training, ERG recommends on-site training that can be tailored to address specific operations, plans, and procedures at your facility. ERG is ready and able to help you establish, improve and/or maintain a safe workplace and a successful regulatory compliance program. If you are interested in other ERG EH&S services, including (but not limited to) on-site training courses, integrated contingency planning, permitting and environmental/safety/hazardous waste compliance audits, please contact us. Register your team today. Please review the course description. 2 Dates ~~ 2 Locations!